Mangaluru, Oct 07, 2017: The ’National Green Tribunal’ (NGT) has approved construction of Yettinahole drinking water project in Sakleshpur taluk of Hassan district, aimed at quenching the thirst of drought-hit Tumakuru, Chikkaballapura and Kolar districts. 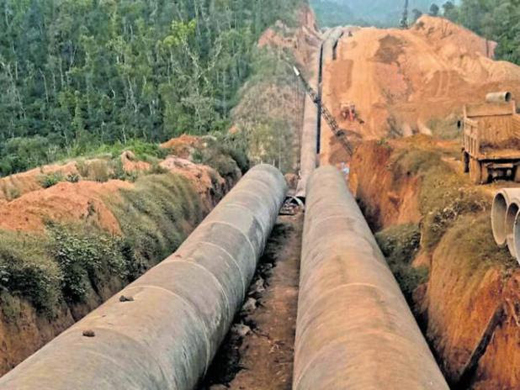 The green panel headed by Justice Jawad Rahim, in its order issued on Oct 5, Thursday, said: “...while permitting the project activity as envisaged by the state government of Karnataka, we direct the user agency to proceed with the construction of Yettinahole Phase-I project only, subject to compliance with various conditions and directions in terms of detailed judgement to follow and as per the law”. While disposing of the petition challenging the project, filed by activist K N Somashekar, the bench also said that since expert member of the tribunal Ranjan Chatterjee is demitting office on October 8, the operative portion of the decision has been announced now. A detailed order would follow, it said. Somashekar had challenged the project in Chennai bench of the National Green Tribunal and subsequently, on his plea, it was shifted to Principal bench in Delhi. Alleging that the project would result in largescale destruction of forest, he said it would have negative impact on the environment. The project also envisages diversion of 24 tmc feet water from the Netravathi river. Dismissing these allegations, the state government said drinking water project does not require forest and environment clearance. Moreover, only after conducting a detailed study on water availability, the project was initiated. Under the project, the state government proposes to lift water from Netravathi river at Yettinahole and supply it to the parched districts of Tumakuru, Chikkaballapura and Kolar.The water would also fill up 527 tanks during the rainy season to meet irrigation needs of farmers. Speaking to reporters, Somashekar said after studying the detailed order, he would decide on appealing against the NGT order in the Supreme Court. Further petitions pending : Two more petitions filed by Kishore Kumar and Purushotham Chitrapura, alleging that the project would adversely affect people living in lower riparian areas of the river and that the state government had not studied its environmental impact are pending before the green panel bench headed by Justice Swatanter Kumar.